Sterndrive The Volvo Penta line-up of diesel sterndrive packages is second to none. The common rail diesel engines are marine diesels, developed and produced by Volvo Penta exclusively for marine applications. The DPH Duoprop drive is the most robust and reliable sterndrive available anywhere. It is built to handle the torque and power of the engines and delivers outstanding efficiency at all speeds. Providing safe driving and maneuvering, even in rough sea conditions. Smart features There are plenty of features that add to performance and handling. Most of them are now integrated in the controls, providing a new level of simplicity at the helm. Here are some highlights. Powertrim Assistant automatically gives you the best possible drive trim. The result is a perfect running attitude for optimum performance and low fuel consumption. Joystick Docking is an amazing feature for sterndrive twin-installations. It lets you move in new ways, by just pointing the joystick in the direction you want to go. Docking and maneuvering has never been more intuitive. The 7" color display gives you perfect overview, with a full color interface and intuitive menus. Single-lever mode lets you control all engines with one lever. Easy and precise even in rough seas. Cruise control is a new feature that provides fingertip control of engine rpm, letting you optimize fuel economy. Volvo Penta diesel inboard With a Volvo Penta diesel inboard, you get all the features for an excellent cruising life. More performance – less CO2 The D-series engines offer a unique marine torque, leading to rapid acceleration as well as efficient cruising speed. By combining clean engines with intelligent accessories for eco-driving, fuel consumption and CO2 emissions are kept at a very low level. Robust control center The new series of controls is your complete command center. Ergonomical and easy to use, designed for smooth driving. Everything is easy to reach, without letting go of the control. Features for easy boating The EVC platform (Electronic Vessel Control), lets you add intelligent features to your inboard engine. Low-speed Mode, Single-lever Mode and the cruise control can all be integrated in the standard controls. From 12 to 900 hp From the compact D1 to the massively powerful D13. Volvo Penta’s inboard range consists of eight different engine sizes with various power levels, making sure you always can find one that’s perfectly matched to your boat. High efficiency, maximum uptime and easy installation The low cost of ownership with Volvo Penta diesel power comes from high efficiency engines that offer exceptional reliability for maximum uptime. Easy installation and worldwide support are also reasons why world leading generator set producers choose Volvo Penta. Keep your engine running High quality with built-in reliability keeps the power production running. Volvo Penta engines are designed for the most demanding commercial operations thinkable: powering heavy-duty trucks, all types of vessels at sea and of course gen sets. When you add long service intervals, quick service and low oil volume – you have a winning equation. A modern cruiser with all the conveniences In line with todays trend the Yamarin 7440 is a two-cabin cruiser with walk-through facility. It is designed for eight passengers and provides sleeping space for three adults and two children. The boat features a spacious pantry, water toilet, a light dinette group and a wide roof hatch. The visibility from the cockpit is excellent in all directions and the 165 hp Yamaha diesel stern drive engine comes as standard. Top-of-the-line equipment A family atmosphere crowns this boating pleasure. The cabin with its roof hatch is light, the dinette is spacious and the equipment is high quality: Warm and cold pressurised tap water, a ceramic Wallas stove heater and a refrigerator are included. A proper cabin boat for fi shing and leisure time The Yamarin 5940 is a versatile and safe cabin boat, as ideal for cottager needs as for cruising and fi shing. Trolling enthusiasts in particular will appreciate the practicality of the open space and the ease of moving about the boat. The cockpit is light and provides good visibility in all directions. Effi cient fresh air ventilation keeps front windows clear in all conditions. The walk-through cabin sleeps 2-3 adults and allows the fi tting of stove heater, cool box and chemical toilet. Safe driving in rough sea The 5940 is an excellent cruiser that starts planing at less than 10 knots, which makes it safe and stable even in high seas. Fresh winds in the HT category The Yamarin 5930 offers completely new style, speed and comfort as a hardtop boat. The walk-through solution is perfect. The front window that opens, foldable stairs, high railings and steps in the undecked space make it easy and safe to move. The boat is very versatile. Front beds, a spare bed on the rear seat and the possibility to install a cooker on the side console make this boat an excellent choice for family use or cruises. If the rear seat is removed it is ready to use for trolling. Comfort has no competition. Large windows, good visibility, large storage compartments, high-quality equipment and great handling meet the needs of any demanding boat enthusiast. A practical canopy as standard equipment! This excellent canopy crowns driver and passenger comfort. It folds nicely into its compartment in the aft. The sides, back and roof can be opened allowing driving whilst standing. The aft functions as expected from Yamarin: practical decks surround the motor well. There are large anchor boxes in the bow and aft. Pleasure boating for several passengers Boating fun for several passengers The Yamarin 5910 is a big undecked boat with performance and handling characteristics to meet all requirements. The high-quality steering console is completely new with a spacious chart table. Passengers are seated comfortably in the aft and bow. All equipment stay dry and safe in lockable storage compartments. Fishermen will appreciate the engine well design which provides a mounting point for an auxiliary engine. Large steering console adds to safety Although the steering console is large it leaves ample space for safe moving about the boat. The boat has high sides and railings offer good support. The driver easily fi nds a comfortable driving position with good foot support. A top boat for trolling and short distances The Yamarin 5210 means top-class handling and easy maneuverability. It moves easily from body of water to another, which makes it a perfect choice for short distances and trolling. Its novelty is distinguished not only by the steering table, but also by stylish dark blue Sunbrella pillows, handy mug holders and an engine well assembly pipe. new superb steering table Even though the steering table is large, there is plenty of room for moving around it. The table has a large space for maps, space for navigation electronics and covered shelving to hold necessary items. Safety at sea and speed for leisure time Yamarin 5010 fisherman�s choice The 5010 model is an excellent choice for a fisherman�s best friend. Its seaworthiness and driving properties are impressive. A large steering console and wide windshield provide good shelter. A spacious chart table makes navigation easier. 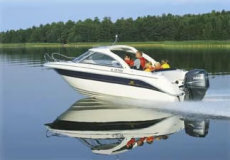 Yamarin 5010S for leisure time 5010S is the right choice for a leisure time boating enthusiast. It is as steady and dependable to drive as its sister model, but the fl ap table and long side bench in the undecked space make it more convenient. The swimming platform is accessible through the gate in the rear seat.